We've asked local people to send us their ideas on recycling, composting, and re-using. The items below come from a variety of people, and we take no responsibility for any health or safety issues - but that said, there are a lot of good tips for us all to appreciate and implement. Please email your ideas to us (link at bottom of page), preferably with a photo if appropriate. The webmaster has the final decision with regard to editing! We are indebted to Prof. Hogwash for his advice on some of the items. Supermarket Carrier Bags: If you go to the supermarket every week, why not SAVE the bags and REUSE them the following few weeks? Plastics are made from oil, and are not currently economic to recycle, so make the bags last as long as possible. It is amazing how few people can be seen doing this at the check-outs. Have you found any other uses for old carrier bags? Yes - we've seen them used as rain hats! Batteries: When you need new batteries for your torch, radio, or electronic device, what do you do with the old ones? If you just chuck them in your dustbin, they end up in land-fill sites where they contaminate the soil with zinc, lead, cadmium, etc. Now you can recyle them using the fortnighly recycling service. The number of batteries being disposed of could be greatly reduced if more of us used rechargeable batteries - these work out very much cheaper over their lifetime, as well as reducing the number needing disposal. Try Argos for batteries and chargers. Cold Frames. These are very useful areas for storing plants over winter giving a bit of frost protection and, more importantly to my way of thinking, keeping the worst of the rain off. After about mid-October the temperature/ rate of evaporation is such that the pots do not dry out but do not need watering either. Mice can be a problem but three solutions suggest themselves. Traps. Safer than poison but have to be emptied/ reset. They do the job however. Keep a cat or cats. I strongly disapprove of buying the sort of cold frames seen advertised in magazines. They are made of plastic (usually) which comes from oil of which we have a limited (and expensive) supply. I don’t care if it is recycled plastic it still takes energy (oil again) to remould it, package it, transport it and sell it. I use wood for cold frames – and glass. (Energy was used to produce these items and none is used to remanufacture them unlike the above. Also wood is renewable). The main wooden frame for the cold frame can be of any old reused wood from old doors, floorboards, even railway sleepers. It does not have to look good – merely do a job. It is amazing what you can reclaim with a hammer and a saw. On top of the base frame I use old windows. The ones in the picture are double glazed – very posh ( and heavy). I get them by asking uPVC replacement window suppliers if they have any old windows. I have always received polite supportive responses ( “help yourself mate” is the commonest reply) and have never been asked to pay for them. Some places have a charity box in the office thought and a donation does no harm. As for waterproofing the wood I don’t like the ‘new’ creosote for a variety of reasons, not least because it needs to be redone annually. The ‘old’ creosote did a good job of both preserving and sterilising and was perfectly safe to use providing you applied it to the wood and not your body. Nowadays there are other alternatives which will come to mind with a moments thought. Remember that waterproofing needs to be done with a non-water soluble material which is not the ‘new’ creosote. What to put in the bin? There are few golden rules but one is NEVER, NEVER put in animal/fish proteins. The reason is simple – you will attract rats for certain sure. You may get rats anyway as they are endemic in towns and villages these days but if you put meat in the compost bin then you will definitely get rats moving in. How to deal with rats? Poison (with care see above), shoot them , trap them, shoot them again (they don’t like it up ‘em) hit them with any hard object. Keep a good ratting dog, BUT most of all –DON’T FEED THEM! Personally I would avoid adding cat litter and the like – rats again. Otherwise we put in any garden waste but always mix grass cuttings up with other more coarse waste to stop it getting anaerobic and becoming slimy and smelly. As a general rule : “aerobic smells good ; anaerobic smells bad”. What else to compost? Autumn leaves are good because they have a fibrous structure which hold the compost open and lets the air in. Just don’t swamp the heap with them – a layer a few inches thick then some grass cuttings then some shredded material and so on – like a layer cake. Pond weed – all that unwanted weed in your garden pond will compost nicely. DON’T use old newspapers in compost or bean trenches especially if you claim to be an ‘organic’ gardener. Newsprint is produced using some particularly unpleasant chemicals which contain chlorine. Now the one element you don’t want too much of in your garden is chlorine. Another compound used in newsprint is sulphur dioxide. Good for sterilising, fumigating etc but bad news on the back of the throat. Newspapers should be sent off for recycling not used in the garden. I personally don’t even like burning them because of the chlorine content. DO use shredded material in compost bins. It is good coarse material (a bit like Bernard Miles’s act) which promotes air flow. We shred anything woody up to about an inch thick. This means you want a good big shredder with as much power as you can get. Anything less than 2Kw is for polishing - not man enough for the job. Shredder design is also important. Some designs have a bend in the outflow cover so that the shredded material has to go round a corner before dropping out the bottom. This is a bad design feature as it promotes easy blocking of the machine. Get one which has a ‘straight through’ design. One more tip – Keep it Sharp – and I mean sharp. If it won’t cut you then it won’t shred wood. Shredded material rots quickly and produces excellent compost rather like leaf mould – excellent for early bulbs in pots. Finally Devon County Council ( or it might be Mid Devon Council ) have a booklet on composting. It gets a bit repetitive but the basics are there. And in the very unlikely event that your neighbours complain about your compost heap, then give them the book and point out that it is Government policy and that you are helping to keep the Council Tax down. I like to reuse pieces of old water pipe – either the blue ( domestic) pipe or the black ( agricultural) pipe often found in skips or discarded in hedgerows etc. As you can see from the picture it bends easily and can be used to make cloche frames which then can the covered with plastic or fleece to make a shelter for early plants. What plastic? I hear you cry. Well sheets of plastic are com mon.. Wrapped around new carpets, washing machines etc it is easy to re-use a sheet of plastic and better than buying a new one from a Garden Centre ( They will call it a cloche but it is only plastic really). The black pipe in the picture has been heated with a blow torch, bent to shape and then plunged into cold water ( rainwater butts are wonderful things). It keeps the new shape and makes a better cloche shape for say a double row of carrots. I usually put a wood frame around the base of the cloche to make it a rigid transportable structure and then move them around the garden as needed. I reuse those white garden labels as well. If you write on them in pencil them it will easily rub off ( with a rubber of course!) and they can be re-used. If you prefer to use an indelible writer then the surface of the label can be scraped with a flat knife edge to give a fresh surface for reuse. Remember they come from oil too. An old plastic chemical bin (free to good homes – just ask politely – I pay/donate £5 per barrel. Compare that with a Garden Centre green barrel made from oil using energy from oil.) Put a tap about 6 inches above the bottom. I put water in mine and added the leaves of nettles, Russian comfrey and horseradish leaves ( why – because I have them and they get in the way). In a few weeks the contents smell evil but out comes a light brown liquid which I mix with water and use on veg such as leeks and brassicas. Again it is almost free , relatively organic ( if that bothers you) and, you made it so you know what is in it. I add water and more leaves from time to time. Wood pigeons are the only birds which abuse my vegetable garden. All other birds are welcome and some even do a good job. Indeed my veg patch supports a small army of robins and wrens together with the odd blackbird and thrush. For wood pigeons I find that old CDs tied on a line so that they turn in the wind seems to work – no wood pigeons anyway and no bird damage. And ,before the inevitable question is asked as to what music frightens the birds most, the answer is, of course, Des O’Connor. A good day for a bonfire is a still day (little wind), blowing away from the neighbours , and starting early evening when there should be no washing out. Have a look round to see what is blowin’ in the wind before you light up. If Auntie Mabel’s ‘smalls’ are dangling before your eyes the a) avert them and b) put your matches away. Do not burn old tyres, they contain all sorts of additives you don’t want released into the air. Wooden pallets are often impregnated with preservatives which contain chlorine (did no-one warn DEFRA during the F&M outbreak?). Some plastics (e.g. PVC) contain chlorine. These are not usually food grade but PVC is used for things like waterproof clothing, wellington boots, building materials like gutters, roof sheets and windows (that’s what uPVC is!) and other external use plastics. Burning plastic with chlorine in is not a good idea and should not be done. We have proper incinerators for such things. Those who don’t like incineration should come up with a suitable alternative and re-cycling isn’t it – it is economically non-viable at the moment – unless the household will sort the types of plastic to give added value to the material. Many plastics are no more than solid petrol for want of a better description, being made of polyethylene (PE) and it’s variations such as MDPE and HDPE standing for Medium and High Density PE. Together with PET (don’t ask) and others such as acrylic, polycarbonate and good old polystyrene. All will burn nicely . They will produce a few nasty chemicals but so does the average diesel engine and we don’t seem to care about those. The important thing to remember is that if you give nature a chance she will do a good job of recycling providing we don’t make it difficult to impossible for nature to work by making large molecules such as plastics (polymers all) or chlorinated molecules, both of which resist degradation by the micro-organisms without which we would be up to our eyeballs in unspeakable material. Remember the good old septic tank – it worked didn’t it – until someone put too much bleach (chlorine again) down the loo. A bonfire turns big molecules into small ones which nature can deal with very nicely thank you. 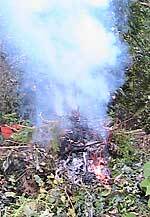 Note: When buring garden waste on your bonfire, remember that the plants you grew (including weeds!) took in carbon dioxide from the air - in the bonfire, the burning material puts it back again, a cycle. This principle is used in the 'biomass' projects when crops are grown to be burnt for heat or power in incinerators, such as the project at Loyton - Ed. Fruit punnets from the supermarkets make excellent mini-propagators. Send us your ideas for recyling by email.